ClickRich: New 2009 Ferrari Dino Spotted? New 2009 Ferrari Dino Spotted? Have I spotted a prototype of the top secret 2009 Ferrari Dino? It is rumoured to be an "entry-level Ferrari to slot below the F430"- this would certainly be that. 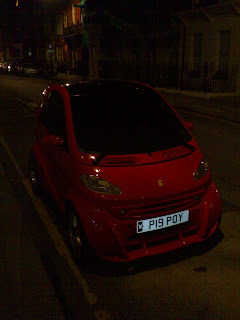 Or could it be the latest in a craze for ironic modifications to Smart cars in W1, London? Is Second Life the new Sharepoint? Get a Blog. Get 3 degrees of Seperation!